With more drivers searching online for their next vehicle, a London-based mobile marketing company is bringing the online experience into the dealer showroom. Tuku is teaming up with Competition Toyota to offer Auto­Tour that delivers detailed information to the car shopper’s mobile device. Shoppers simply tap or scan one of six AutoTour touchpoints on showroom models. Each touchpoint is associated with one of six key purchase criterion. 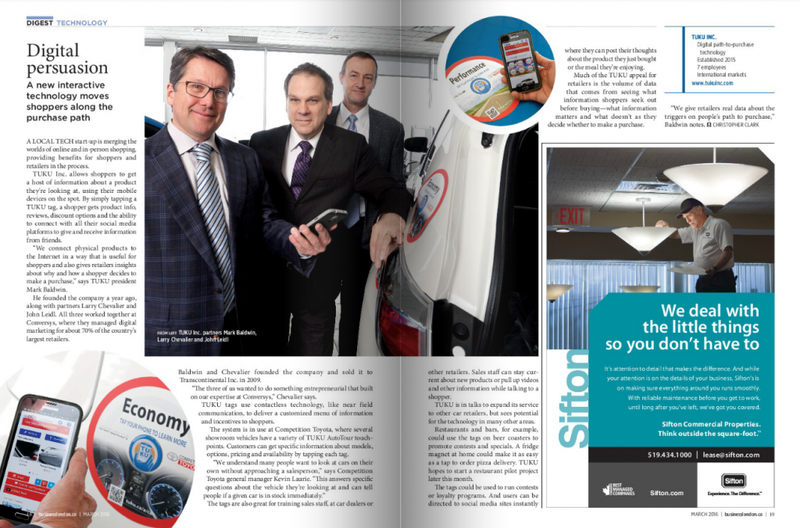 “AutoTour gives people the information they want about a vehicle right away, without the need to search multiple websites,” Tuku president Mark Baldwin said. “It’s fun, interactive and effective.” For shoppers without smartphones, Competition Toyota provides tablets so they can take advantage of the Tuku experience. “We understand many people want to look at cars on their own without approaching a sales­person. And when they do, they usually have specific questions about the vehicle they’re looking at,” said Kevin Laurie, Competition Toyota general manager. Competition Toyota and Tuku are running a “Tap to Win” ­contest for every shopper who taps or scans an AutoTour touchpoint.